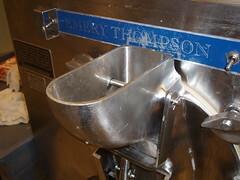 I was working on an article about the best Ice Cream in Columbus for C-Bus Magazine at the end of March. When I e-mailed Denise’s owner, he insisted I give him a call. When I called him, he told me to drop by. If you talk to Stan Zafran, you are going to talk about ice cream. If ice cream happens to be your topic he is going to have you make ice cream. He will ensure you make a mess of yourself in the process – if fact if you don’t, then he is a bit bummed out. I showed up around noon – I knew Stan is talkative and passionate about his ice cream so I figured we would spend about three hours together – it was more like six. 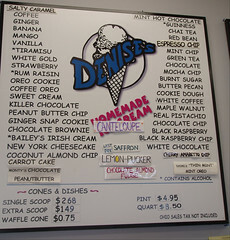 First Stan had me sample every flavor – kind of an ice cream flight – a la Sideways. Stan taught me about the elements of ice cream – specifically – what makes good ice cream. Then we got to work. I made Chocolate Chip, Peanut Butter Chocolate Chip and Pistachio. It was messy but I loved it. It reminded me of my first job at Knight’s Ice Cream. Here is the scene of the Crime, an ice cream maker..
Stan and I discussed a lot of things while we were working together – Boston (his old stomping grounds and where Denise’s originated) vs. Columbus, doing business in Clintonville, Midwestern demographics, etc., but mostly we discussed ice cream. Creating a flavor is an art – but making the taste cross the line from good to great ice cream is a science. Stan approaches ice cream making like a craftsman with some mad scientist thrown in for good measure. He has the creativity to create inventive combinations (like Chocolate Sorbet and Burnt Sugar) mixed with the precision to make sure that all of the best ingredients blend together at the right time in the right way. 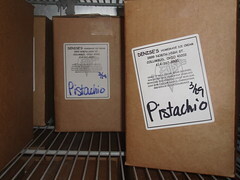 If you have not tried Stan’s labors of love, make sure you drop by Denise’s – you will find flavors you never thought of – and you will find something you will like to lick. Try two of the newest flavors Canteloupe and/or Blueberry (when Stan e-mailed me about Blueberry he described it as Kickass Blueberry, – it is). If you can – see if you can combine a half scoop of both for a perfect spring treat. 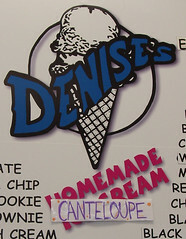 I have been doing some follow up sampling at Denise’s – my favorite flavors are currently Carrot Cake and Thin Mint Mint Oreo. Yum. This entry was posted on May 6, 2007 at 10:56 PM	and is filed under ice cream. You can follow any responses to this entry through the RSS 2.0 feed. You can leave a response, or trackback from your own site.